Immerse yourself in Irelands ancient past with Experience Gaelic Games and walk away with memories to last a lifetime. 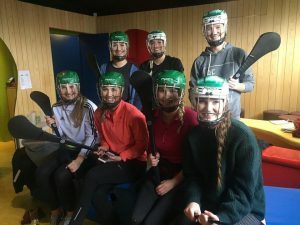 Experience Gaelic Games has a unique package that sees you at the centre of memory maker experience in Dublin. You will be thrust into an ancient culture. A culture which is a key component in everyday life in Ireland. Come play Gaelic Games with us and “Do as the Irish Do”. We ask you to spend the day in the Gaelic World in a fun filled environment, whilst enjoying the wonder of our greatest and most cultural activity with a fun difference in Dublin. Experience Gaelic Games strives to bring you into the heart of what it is to be Irish, for an unforgettable, unique activity that will shape your visit. The myths and legends surrounding our games have created a magic aura. Experience the Gaelic legacy and get a unique insight into Irish Culture. Understand the passion the Irish have for their Gaelic sports – Gaelic Football, Hurling and Handball. Your experience is brought to life by our wonderful team of passionate coaches. A session with Experience Gaelic Games gives a unique insight into the pride and passion the Irish have for their native sports. You will be taught the games and our coaches will help you zone in on your skills. Before you know it, you will have your take away memories walking away with a passion for our Gaelic legacy. So why not become a Gaelic warrior and immerse yourself in Irelands ancient sporting culture with Experience Gaelic Games – creating a memorial day with a difference in Dublin – a day of fun, enjoyment, adventures and steeped in history. So, open the door and step into the Gaelic world. Enjoy your memory maker experience in Dublin with Experience Gaelic Games.